There has been a ton of hoopla over Windows Phone 8, enough to send WinPho 7 users' feelings right into the dumper. "Why should we be punished for jumping in early? ", they ask. "Microsoft, why hast thou forsaken us?" Sure, now that its lusciously beautiful (but app-hobbled) mobile successor has hit the market and a new update is even due to come out for it, users of younger sibling WP7 have plenty of reason to feel neglected. But worry not — the company hasn't forgotten about the legacy platform, at least not completely. TechCrunch asked Microsoft point blank about the long-awaited WIndows Phone 7.8 update, and a rep said, "We have made no further announcement on this but hope to share more details in the near future." Some pundits are predicting that this means it won't see the light of day until early 2013, but Tonis Tech Blog cited sources who believe those words could reference a much faster timeframe — like, say, this week. Or more specifically, Wednesday. Lending to credence to this notion is a leaked video showing a Lumia 510 running what looks like 7.8., which could mean this update's about ready to drop. WP7 users have been waiting since June, when the company mentioned this update, and jealously watching the bevy of Windows Phone 8 announcements. Well whenever it ultimately arrives, update 7.8 will bring along a piece of that WP 8 pie, courtesy of the newer, more flexible homescreen. Expected features include the customizable Live Tile sizes, more themes, Bing wallpapers and possibly upgrades to Internet Explorer. There's even a rumor about Bluetooth file-transferring capability (for Xbox music store access). What hasn't been rumored or even suggested, however, is support for WP8 apps. The underlying kernel within the two operating systems is different, so there's really no hope for that, unfortunately. The fact that Microsoft may finally be pushing out 7.8 after months of waiting is cold comfort. But hopefully it won't be too long now. 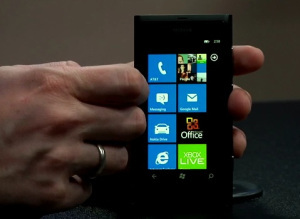 Windows Phone users, are you still hanging in there with a WP 7 phone or have you upgraded to WP 8 or another device? Weigh in. UPDATE: No joy this week for Windows Phone 7 users, sadly. Microsoft has confirmed that the 7.8 update will be coming in Q1 2013. Click here to read more about it.